Back around 12 years ago I did a lot of email marketing to rented email lists. Then we had the spam email explosion and that basically killed the rented email marketing universe, just because people were getting too much email. I have never been in agreement with Seth Godin’s idea that you must never email to anyone unless you have permission. A guy I used to work for said he thought it was easier to get forgiveness than permission, and I like that concept. But on the other hand, it is good to build up a list of people who have contacted you and given you permission to send them email. Then they tend to be more accepting of and interested in your email when it comes. So how do you build up an email list? Basically you have to put up multiple ways for people to contact you on your site, and offer them multiple things that they would want, where they have to give you their email to get it. Contact Forms on Your Services Pages: If you have various pages on your site talking about your products or services, put a form on each one of those pages so the person can contact you for more information. On my site I have forms for people to contact me regarding SEO, pay per click advertising, social media marketing, and so on. Then when someone fills out one of the forms, they get an automated email right away that tells them that they will automatically be subscribed to my newsletter, and they can opt out at any time. Email Newsletter: Offer a free email newsletter subscription on your web site. This doesn’t have as much appeal as it used to because people are getting so many emails. But if you put together a good newsletter with good content and promote it, people will come. Of course you have to commit to writing and putting out the newsletter regularly. I have sometimes seen companies have videos on their site and make people give their email to see the video. But generally I have not seen that work as well as offering people a white paper. Somehow the offer of a free report or white paper seems like more of a tangible item that people would receive, rather than just seeing a video. 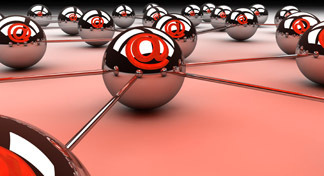 Once you build up hundreds or thousands of names, you can email to them on a regular basis. I would say that usually up to once a week is OK. More often than that and you will start to get a lot of askoffs. Send them an email newsletter. I am sending mine out weekly now, and I get a steady stream of business from it. The main part of the newsletter should be some article giving advice or data of some value, but you can include ads or blurbs selling your products, and of course with lots of links to your web site and blog. You can have more than one article, or an article along with various news items about your company. But I have generally seen that one article is adequate content for a newsletter, along with some short blurbs and ads for your services. The article should be 300-800 words. You can also come up with emails promoting special offers, new products, old products. You can also send out a press release announcing some new product or service whenever you start a new one. You can either send using an email program that sits on your computer desktop, or you can use one of the cloud based email services. I used a product called Mass Emailer for years that is desktop based, but recently it just stopped working. I found a new product for desktop based emailing called Send Blaster, and that is working well for me. I create my HTML newsletters or emails in Dreamweaver, then send to my heart’s content. There are also several online email services, including Constant Contact, iContact, Aweber and Mailchimp. Those are the most popular services. Constant Contact is perhaps the most well known, but I find it the worst in terms of giving you different options to do different things. I like Aweber the best and use it for most of my clients. These services cost in the neighborhood of $20 per month at the beginning. You sign up, set up your list or lists, then create a web form, and put that onto pages of your web site. Some HTML knowledge is required to get it set up with your web site. Then to send something you log into your interface and either use one of their templates or upload a file you have created using Dreamweaver or some other web authoring program. Also makes sure you comply with the CAN-SPAM Act, with mainly consists of putting your physical address in the email, and having an opt-out option for people. And you have to remove anyone who asks off in 10 days. Good luck with building up your email list.